As my close friends and family know, food is a big part of me (though, I´m not that big). I have an appetite of an elephant and the size of an ant. I simply love food. Of my top 5 Things in Life, eating a good meal is a very close second next to spending quality time with close friends or family. Obviously the combination of the two is the ultimate trump. A lot of times for lunch, I´ll go home to the house and eat dinner leftovers. And I´ll just sit and eat, nothing to read, nothing to watch. For many years, I used to always need some other type of stimulation while I was eating, whether it was rereading the back of cereal boxes when I was a kid, watching TV with my plate on a chair as a teen (shoot, I still do that), or checking my E-mail when I was in college. Now I just sit and eat, rest my mind, and concentrate on the moment and the food I´m eating. Maybe I picked this up after watching Eat, Pray, Love several months ago, but I can´t blame Julia Robert´s character for trying it. It´s such a different experience when it´s just you, your food, and your thoughts. Like an intimate relationship. When I was on newspaper staff in high school, we used to order these huge burritoes from a local hole in the wall during production week, and I remember my then-Editor-in-Chief Will Litton saying, "You have to make love to the burrito" and he would close his eyes, and slowly bite and chew the chickens-bean-guacomole-queso-rice-filled tortilla. His make out/love/eating session would last quite the moment. I, likewise, share the same care and love for food. I´m the type of person who will eat anything. Though, at this moment, I´d like to make a shout-out to those special foods who tear at my heart-strings. To do this, I will categorize this by meals. Since I was a kid my favorite breakfast is Spam and Rice. 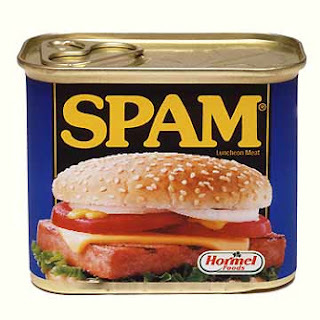 Simple, from the can (made from Minnesotta, who knew Jordan Differding), spam cut up thinly, fried to a crisp, and eaten with plain rice-cooker rice. Eaten with fork and spoon---Filipino style. If you really want to get into Filipino style, you could eat with your hands (right hand for mouth, left for tearing meat), and sit on your chair with one foot on it having your knee all up in the air. Also, if it was a true Filipino meal, there wouldn´t just be spam and rice on the table (there are never just two items for any Filipino meal) and you might find dinner leftovers made into some type of fried rice, fruit, and probably a combination of eggs. Now, it´s not like I can show up at someone´s house or Denny´s and ask for Spam and Rice. That just wouldn´t be right. So the next best thing is bacon and eggs. Emphasis on the bacon. I don´t mess around, bacon is up there on my top five favorite foods ever---for it´s crunchiness, greasiness, saltiness, and versatility (it can show up on your eggs, in a sandwhich, on a burger, even around yummy appetizers). It´s simply amazing. As for the eggs, I love my huevos sunny side up, very runny to soak up with with bread, or the Filipino way, with rice. Gallo Pinto is the typical Costa Rican breakfast made up of fried up beans and rice. It´s cooked differently everywhere I go, but a well made one takes the cake. Again, insert bacon and/or fried eggs here. If none of these are available, I do appreciate a good cereal that has crunch, almonds, and oats all up in it. I love this cereal here in CR called "Komplete" Miel flavored. It´s comparable to Honey Bunches of Oats with Almonds, my favorite cereal in the U.S. If there is a food I have been most deprived of the past five years (fours years in D.C., one year here in Costa Rica) it would be good ´ol Southern fried chicken. 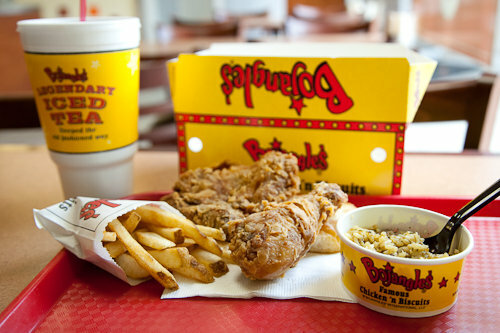 Where is my Bojangles??! Ah, the right formula of cruchiness, greasiness, with hot sacue (Texas Pete, Tobasco go away) is again up there in top favorite foods ever. Add in Bojangle´s seasoned fries or if I´m at home, a plate of rice and I´m in heaven. Throw in a glass of cold, sweet tea. Add in a heart attack, but it´s well worth it. Give me a sandwhich with thinly sliced salami, tomatoes, cheese, and bacon and I´m good to go. Or a good meaty restaraunt burger with cheddar cheese and bacon and I am on like Donkey Kong. Or a good chicken sandwhich from Chik-fil-a (again, very southern). With either, a plate of fries is a must. Side note, fries are one of my top favorite foods ever (Bojangles´seasoned fried or Chik-Fil-A´s waffle fries or when I´m home I´ve made fries a several times). Actually, the potato itself is top two, and I rank how much I like them based on its crunchiness and friedness----french fries, tater tots, hash browns, latkes (prounounced "la-kas". I would be Jewish solely for these bad boys), baked potatoes and last, mashed potatoes. One of my favorite meals ever has been my mom´s egg rolls, dipped in vinegar, eaten with plain rice, all by hand. This is probably my most missed meal and haven´t had in a very long time. It´s a treasure of my childhood though and special occasions. Arroz con pollo is also very Tico and is literally translated "rice with chicken". It is fried up rice with bits of chicken and vegetables mixed with it eaten with frijoles molidos or refried beans and eaten by scooping all of it with big potato chips. If there is a meal I´ve had fourths and fifths of, it would arroz con pollo down here in Costa Rica. As difficult as this category is, I have to break it up with all the different parts of the dinner meal. If there is one food completely missing in Costa Rica, it´s the big, fat, juicy, medium rare steak that we have in the United States. As tender as the Filet Mignon is, it´s not enough food. 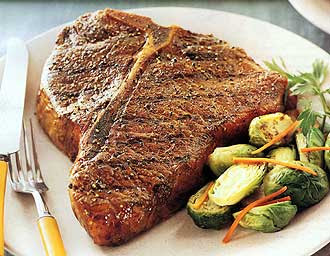 Slab me that New York Strip, Ribeye or Porterhouse 20 oz and now we´re talking. Hit me with a side of asparagus, maybe a mushroom sauce (both top five vegetables), and some type of variation of potato and I am loving life. Since working at a Japanese restaraunt, I´ve always loved their steak Hibachi style with all the different sauces. Dessert. Now I´m not much of dessert guy (I always felt bad when cookies or brownies were given as gifts from friends and I couldn´t eat it all). Honestly, I´m the type of person who would rather half thirds than a plate of pie. But if I had to choose, my favorite desserts have always been in fruit form. I love me some cold, cut up mango or watermelon. Also, my cousin Titat´s cookie cake topped with cool whip and a variety of fruit on top has been a local favorite. Since working at Moe´s, I´ve had a knack for creating the tasty burritoes and tacos of different ingredients. I already made it a law (discussion with unknown wife not necessary) for my future family to have at least one Mexican night where I can conjur one of the above contraptions. If I were to have a pizza all to myself (or with someone with my same-tastes), it would be a thin-crust pepperoni, mushroom, and anchovi. Yes, anchovi. I remember when I was a kid my family and I went to Kitty Hawk Pizza in the Outer Banks, and my dad was insisted in asking if they had anchovies. I never had heard about it before, but I wanted to have what my dad was having. And the thin pieces of it on my pizza was delicious. As for pasta, I love me a good white sauce (something I´m currently try to make well) with a linguini or a good garlic red sauce with penne. Or better yet, a good pesto is my favorite and is the next sauce I´m learning to make well. What I like about Italian food is that it´s pretty filling, which is pretty important if I´m involved. As for seafood, I love me a good tuna steak (raw in the center), or better my Dad´s salmon, or cracking blue crabs or Alaskan crab legs. Sushi hits the spot, too, with wasubi, tuna or shrimp tempura being top favorites. The thing about seafood is that it´s often not enough to fill me up. Problem-city involving this continously hungry stomach. Disclaimer: As much as I mentioned different brands, I will say that a home-cooked meal of anything is my favorite. I am going to go ahead and say that a well-cooked breakfast, lunch, or dinner is one of the best gifts you can give me, or in my opinion, anyone. With that said, I´ve been trying to train myself this past year to be a better cook, so I can one day deliver this kind of gift to people. I´m a little ridiculous when it comes to food, I know. But it´s the little things that count in life, right? One bite at a time. Love it, Mateo. (Totally made a crack the other day about you, hot sauce, and rice to Jules.) Spam brings me back to the good ol' days of countertop conversation.